Chemical weapons experts will arrive in Douma on Wednesday to investigate an alleged poison gas attack, Russia said, as the US voiced fears Moscow may already have “tampered with” evidence at the site, writes The Guardian on Tuesday. Russia and the Syrian regime have been accused by western diplomats of denying chemical weapons inspectors access to sites in the town of Douma, where an attack killed dozens and prompted US-led missile strikes over the weekend. Russia and Syria had cited “pending security issues” before inspectors could deploy to the town outside Damascus, said Ahmet Üzümcü, the director general of the Organisation for the Prohibition of Chemical Weapons (OPCW), at a meeting of its executive council on Monday. 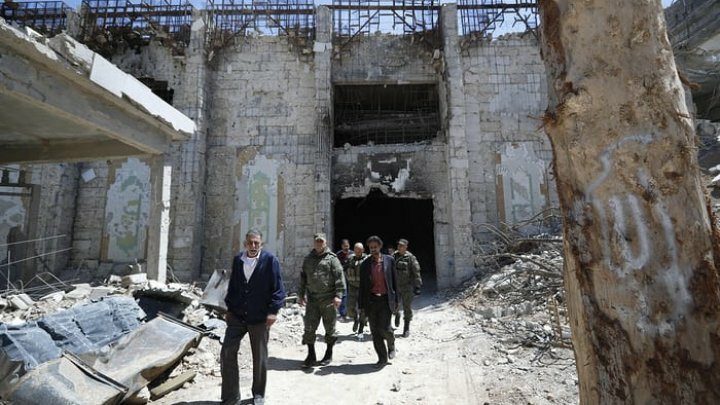 Syrian authorities were offering 22 people to interview as witnesses instead, he said, adding that he hoped “all necessary arrangements will be made … to allow the team to deploy to Douma as soon as possible”. Meanwhile, the Trump administration delayed action on sanctions against Russians suspected of helping Syria’s chemical weapons programme, contradicting remarks on Sunday by the US envoy to the UN, Nikki Haley. At the meeting on Monday, the OPCW director general, Ahmet Üzümcü, said his team of nine volunteers had reached Damascus but so far “the team has not yet deployed to Douma”. Syrian and Russian officials had warned of “pending security issues to be worked out before any deployment could take place”, Üzümcü said. The US ambassador to the OPCW, Ken Ward, claimed the Russians had already visited the site and “may have tampered with it with the intent of thwarting the efforts of the OPCW fact-finding mission”. The Kremlin dismissed the claims. “I can guarantee that Russia has not tampered with the site,” said the foreign minister, Sergei Lavrov. The weekend missile strikes by the US, Britain and France were in response to a chlorine and sarin gas attack in Douma on 7 April in which 40 people were said to have been killed. Igor Kirillov, the head of Russia’s radiological, biological and chemical protection unit, said the roads still had to be de-mined and cleared and would be tested by UN security services on Tuesday before inspectors could go in. The missiles that US, French and British warships fired on suspected chemical facilities on Saturday constituted the biggest western attack against the regime in the seven-year war between Syria’s president, Bashar al-Assad, and forces attempting to topple him. The targeted sites were largely empty and were all said to be facilities for chemical weapons storage or production. The UK prime minister, Theresa May, and the French president, Emmanuel Macron, have each faced a political backlash for conducting the air strikes with the United States. Despite polls showing scant support for the move, May said it had been her “responsibility as prime minister to make these decisions”, while Macron also defended his move as part of his constitutional powers. The trio that carried out the strikes warned they would repeat the operation if Damascus used chemical weapons again.